If you live here in Utah, you're most likely familiar with Cafe Rio. It's a fresh Mexican restaurant that has very yummy food. Well the first time I ever ate at a Cafe Rio, I made the mistake of asking them if they had refried beans. 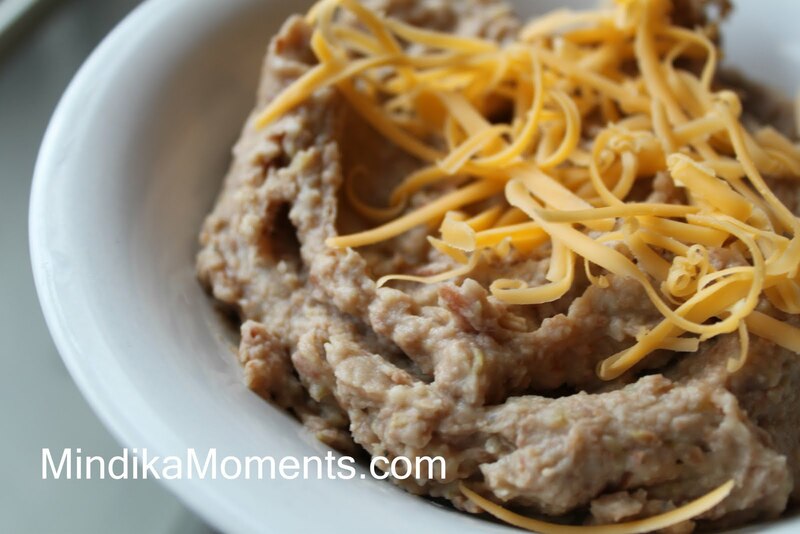 I love refried beans! The response I got from the cute guy behind the counter was, "Miss, (I was a miss back then) If you had any idea what happens to the poor pinto bean in order to make it refried...you'd never eat refried beans again." Honestly I'd never given the process of making refried beans much thought. But as I looked into it, most refried beans sold in stores and served in a large majority of your favorite Mexican restaurants, are loaded with fat or lard. I think that's what my Cafe Rio friend was talking about. Well, needless to say I eventually came up with my own homemade refried beans. These do not contain lard and are full of flavor. They're also rather easy to make. I use this recipe to make all kinds of meals, dips, and side dishes. Some favorites include, tostadas, bean and cheese burritos, or 7 layer dip. But as I mentioned before, I love refried beans, so a big bowl topped with cheese works for me too. 1. In a large sauce pan, melt the butter over medium heat. Add the garlic and cook for a 2 minutes until the garlic is soft. 2. Add the beans, green chili's, pepper and chicken stock. Turn the heat up to high and bring to a boil. 3. Turn the heat back down to medium and allow to simmer/boil for 10 minutes, or until the stock has reduced by half. 4. Take off the heat and blend, using an immersion blender, food processor, or stand blender. You can blend as much as you like, either making the beans very smooth, or leaving chucks of bean etc. Ooh Fun! I can't wait to try it. Great post! Should save a lot of $$ over the canned!